My first solo show on the North Shore opens at the Tettegouche State Park Visitor Center, 7-8:30 pm Friday Dec 1. Briand Morrison will provide entertainment, playing guitar and singing. Enjoy food, drink, and conversation. I will offer a landscape painting demonstration that day from 2:30-4 pm. Visiting relatives or touring Lake Superior’s North Shore? Please stop by the center on Highway 61; it doubles as a MN/DOT rest stop. Show runs through the end of December. Tettegouche State Park Visitor Center, 5702 Highway 61, 4-1/2 miles northeast of Silver Bay, MN on the North Shore of Lake Superior. Open Daily 9 am – 4 pm. Exhibit and its events is free and open to all; no state park fees apply to visitor center. Enter to win the painting of your choice from among three works. Drawing is Sunday, November 5th at 6 pm. Winners announced here and on GregLeckerArts social media channels: Facebook, Twitter, Instagram, Pinterest, and Tumblr! Banfill-Locke Center for the Arts (BLCA) is a nonprofit community art center. Greg Lecker began his residency in March of 2017 and it will continue through August 2018. Greg looks forward to sharing his love of nature and art with Banfill-Locke visitors and students, and especially residents and workers of Fridley and the northern metropolitan Twin Cities. His residency will finish with an exhibit of his work created while at BLCA. The exhibit is scheduled for July 28 to August 25, 2018. “Greetings from the North Woods: Works by Greg Lecker” opens Friday, December 1 at Tettegouche State Park Visitor Center, Highway 61, just north of Silver Bay, Minnesota on the beautiful North Shore of Lake Superior — and Greg invites you to celebrate with him from 7-8:30 pm! Enjoy art, food, conversation and the music of Brian Morrison! Look, wonder, enjoy, thank, create, share, learn, teach…every day! That has been the stated mission of GregLeckerArts since posts began more than a year ago. Over 200 followers turn to this Facebook page for their daily arts news and inspiration. Content includes notices of art openings, nature blog postings, opportunities to make art, art techniques and demonstrations…. and yes, work by Greg Lecker and his artist friends. Posts are brief and almost always include an image and a link where you can learn more! These pink peonies were picked just before fading and painted to capture the transition from spring to summer 2016. Photo-collage of painting progress (from my June 9 social media posting. Step by step, following is the painting progress and the finished painting. Visit #183 Northrup King Building, 1500 Jackson Street NE this Saturday 12-4 pm (and every Saturday) to see the painting for yourself. Add background, adjusting drawing slightly. No ivory black is used; instead, dark chromatic pigment is a varying blend of Ultramarine Blue, Alizarin Crimson, and a “dash” of Cadmium Yellow Deep. Add tablecloth, cast shadow, and vase; now adding white to colors. At the same time, lightest portions of flowers are noted by rubbing out the underpainting. Color of shapes are adjusted by adding paint. Ask: is the shape lighter or darker, warmer or cooler. Flowers and foliage emerge from the underpainting! Still more shape adjustments are made, including pulling the background paint inward and pulling the still life paint outward. Flower shadows are connected and adjusted slightly towards the blue rather than the violet. Painting is nearly complete – this time photographed outdoors for truer color. The previous photographs exaggerate the warm halogen light cast. Final painting: Adjusted background color slightly, added highlights in forward blooms, softened some edges. Photographed under better lighting. 2016 ART-A-WHIRL – Report; and Thank You! Thanks to all who visited and supported artists! 2016 ART-A-WHIRL – Painting Demonstrations & Giveaways! Fifteen mini-demonstrations are planned – one on each hour Friday 6-9 pm, Saturday 1-7 pm, Sunday 1-4 pm. Throughout Art-A-Whirl, on the hour, Greg Lecker dons a hard hat advertising “Artist at Work”. Signage provides a short written summary of the 5-10 minute painting demonstration to follow. On a small tan toned panel, on which the landscape subject is pre-drawn, Greg paints shadows in blue-gray paint that vary in value and saturation with the distance to the subjects. After quickly “freezing the light”, Greg begins to add middle tones, highlight, and light source. At the conclusion of the brief demonstration, instead of signing the piece, Greg stamps it “Artist At Work”. One mini-workshop attendee wins the partially finished painting, source photograph, and a small acrylic paint kit to take home to complete the painting. Other attendees are invited to take home drawing kits with drawing pencils and paper. Everyone is a winner at this Art-A-Whirl Artist-At-Work demonstration. Kami Mendlik inspired me to paint these lilacs. During the Bryn Mawr Festival of Garage Sales this past weekend (May 7 & 8), I arranged these in a watering can since I couldn’t find a vase large enough for the bouquet I had collected. I painted for about four hours on Saturday, less time spent speaking with neighbors. Even in the shade, the flowers wilted over this time — as did I. Overnight, in the coolness of the garage, the blooms perked up — so I started anew on Sunday; and I did my best to capture their beauty, if not their fragrance. Check out the following time-lapse; then read the tips I collected from a recent two-day workshop taught by Kami Mendlik. Step 2: Filling in Shapes – Paying attention to whether shapes are cooler or warmer, darker or lighter. Step 4: Refining Flowers and Foliage, including Stems; pushing and pulling edges into one another. Step 5/Final: Softening select edges; Refining highlights; Adjusting foliage, flowers to overlap watering can rose head. It was calling too much attention to itself! – Draw arrangement carefully – using brush or pastel pencil if necessary. – Envelope outer forms with straight voluminous lines, not curves, not zig-zags! Fill the panel. – Key to rendering water in vase (if applicable) is to accurately match shape, value, & color. That methodology is applicable when painting flowers too. – Don’t “paint” petals or leaves. Paint the shapes, values, and color – and the still life elements will be revealed in your painting. – In painting backdrop, note what is cool and what is warm colored. – Use enough paint – it allows pulling forms into one another. – Refine by pulling still life elements outward and background inward. – As you look at edges between shapes of different color or value, ask yourself – wamer/cooler, darker/brighter? – Soften edge between tabletop & backdrop. There is so much more to learn! Visit www.kamimendlik.com for class & workshop schedule. I will be at Gallery Immaginé, #183 Northrup King Building, 1500 Jackson St NE, Minneapolis this Open Saturday, April 16, 12-4 pm. Please stop by and see my ongoing WXSW show. Though the show continues through May 14, this Saturday will be the last day to see the painting of Rickeldoris candy store pictured below. Following this weekend’s Open Saturday, I will ship the painting to its new Arizona owner. On a whim, I had e-mailed a picture of the painting to the Jerome, Arizona Chamber of Commerce. As fate would have it, the volunteer forwarded the picture to the new owner of the store; and she inquired about purchasing the painting. It is fitting that she will own the piece to help commemorate her mother who operated Rickeldoris for twenty years until her passing the week before my December 2015 visit. In the Southwest portion of the metropolitan Mpls-St. Paul, visit Edina Art Center to see Water Slide, a newly framed work of mine. This Thursday, 5-8 pm, stop by the opening reception of the Minnesota Artist’s Association Spring Show. I extend heart felt thanks to the 60+ visitors who contributed conversation & purchased art at my WXSW show preview and opening March 18 and 19. You, the viewer, make our art possible! The show continues — read on to learn more. Over the past several years, Minneapolis artist Greg Lecker travelled to Catalina Island, the Badlands, and Arizona to paint varying landscapes. Subjects include the red rocks of Sedona, Sonoran Desert of Arizona, the continually eroding wall of the South Dakota Badlands, knobby granite dells, and the Grand Canyon. Greg schleps a large, twenty-five-year-old blue backpack with tripod and portable paint box. 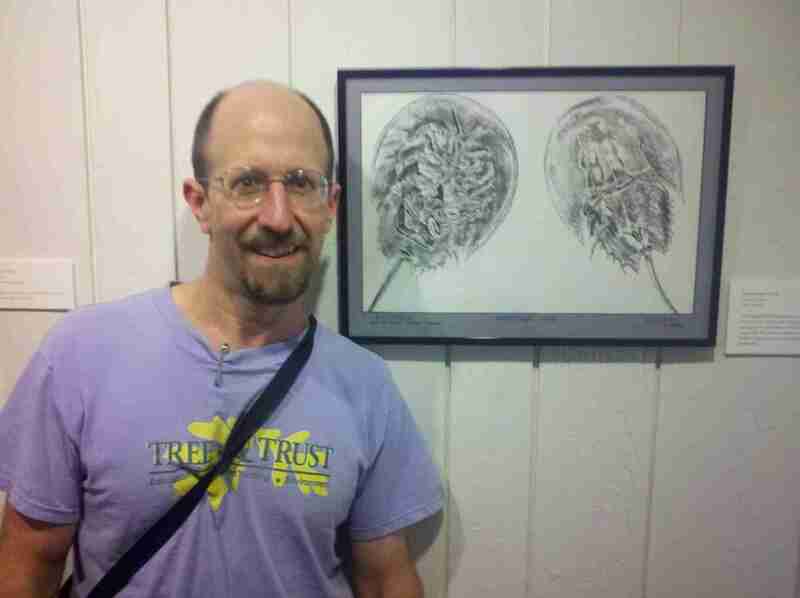 By traveling merely to his Northrup King Building gallery in Northeast Minneapolis, you have the opportunity to view Greg’s graphic travelogue. View paintings under New Work tab. Please stop by to see my new work! Courtyard Clearing painted during #artshanty pop-up at Minneapolis Institute of Arts. 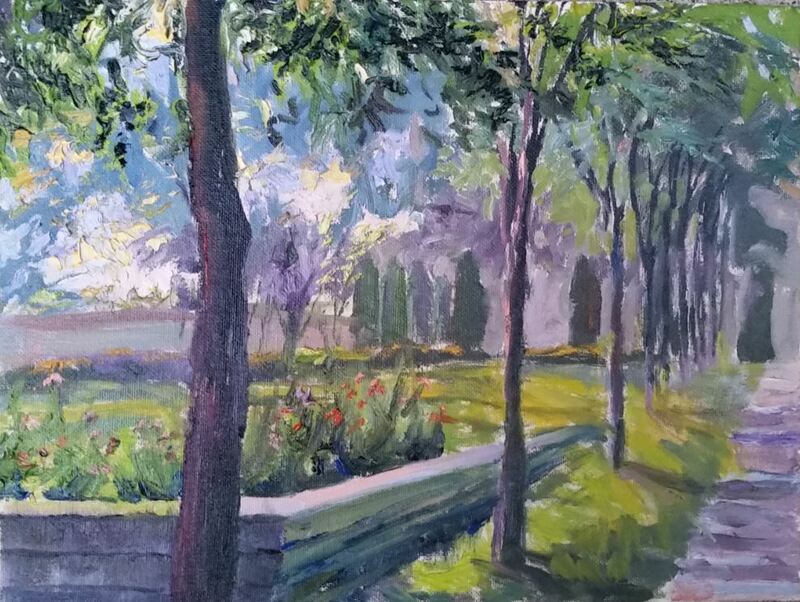 Watch Outdoor Painters of Minnesota at work in Target Park during museum hours September 10-13! SURPRISE event at Minneapolis Institute of Arts Thursday, Friday & Saturday, September 10, 11, 12, 10-4 pm & Sunday September 13 from 11-4 pm. Look for announcement Thursday, September 10! In 2014, Minneapolis artist Greg Lecker travelled 10,000 miles by car, canoe, ferry, hiking boot, & airplane to paint both gray & green landscapes en plein air (in the open air). Greg captures changing light in the man-made & natural world in paintings filled with color, motion and emotion. He communicates his “real-time” experiences with passersby and shares newly finished oil paintings – sometimes still wet — with gallery visitors and collectors to trigger memories of favorite places or make introductions for newly discovered treasures. Subjects include the Sonoran Desert of Arizona, the continually eroding wall of the South Dakota Badlands, water lilies on a local lake, a favorite campsite on the Superior Hiking Trail, trout streams, and Mississippi River towns. Greg schleps a large, twenty-five-year-old blue backpack with tripod and portable paint box. By traveling merely to his Northrup King Building gallery in Northeast Minneapolis, you have the opportunity to view Greg’s travelogue. Details: #183 Northrup King Building, Gallery Immaginé, 1500 Jackson Street NE. Opening on Saturday, April 25, 12-6 pm. Show continues through Art-A-Whirl – Fri., May 15, 5-10 pm; Sat., May 16, 12-8 pm; Sun., May 17, 12-5 pm. Talk with artists, enjoy food & drink, discounts, & door prize. THANKS to visitors to WILDFLOWERS 2014 Shows at NKB & Bassett Creek Arts! Many thanks to those who attended the art openings of “A Year of Wildflowers”. The show, “A Year of Wildflowers” continues at the art and framing shop and at my Northrup King Building, 1500 Jackson Street NE, Mpls, #183 – Gallery Immaginé. Please bear the brief sponsor message – the cheery colors of the flowers and drawings are worth the short advertisement! Bassett Creek Arts, 416 Penn Avenue South, Bryn Mawr, Mpls, www.bassettcreekarts.com. As of January 1, 2014, Greg Lecker’s work may be viewed at the cooperative gallery, Gallery Immagine in THE building to see contemporary art in the artists quarter of Minneapolis. Conveniently located on the first floor just steps from the main entry, the gallery is open most Saturdays from 12 Noon to 4 pm and on all First Thursdays (except for July 3) from 5 – 9 pm. View the work of over 200 artists; and don’t miss the unique opportunity to speak with the artists themselves! Through vibrant oil pigment, Greg Lecker shares glimpses of his experiences of the landscape – submitted for the viewer to compare with their perceptions. We travel through an enchanting, ever-changing environment of visual stimulation. In direction, intensity, and color, the quality of light changes throughout the day and night. From season to season too, the illuminated environment is transformed. Practicing as an architectural lighting designer for the past twenty-five years, light has been Greg Lecker’s medium. At the same time, Greg continued to draw and paint subjects largely drawn from the natural world. Greg continues to learn from fellow members of a figure drawing cooperative and from landscape artists of Outdoor Painters of Minnesota. He captures light and renders three-dimensional space on a simple flat piece of paper, wood, or cloth. Workshops, private; and studies with Joe Paquet; School of Visual Arts (NYC) – Anatomy and Portraiture. Member, Outdoor Painters of Minnesota. Juried Exhibition, Minnesota State Fair, Fine Art Exhibition. Bryn Mawr Bugle “Drawing On Nature” and “View From The Bridge” columns 2003 to 2013. To view publications where my illustrations or photography are included, visit the “Blogroll” on the right-hand-side of this website. Click on the year desired, then from the website, navigate to Bryn Mawr Bugle, and the issue, and scroll through to find the column. Or, click on the Nature Notes link indicated, then scroll through the Nature Notes blog entries.